NOTE: THIS SITE IS FOR INTERNATIONAL (NON UNITED STATES) TEAMS. If there is no qualifying site near the team location or for special circumstances, the teams may register on-line for the Video Submission site. Video submission teams are required to pay the same registration fee. 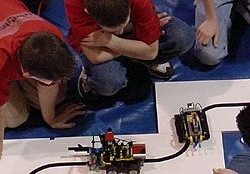 The coach must submit the signed Robofest Video Submission Form to include a link to the video (YouTube, Vimeo etc) to [email protected] It must be received by 11pm EDT April 15, 2016. The following is the suggested video contents: Start with the team and team member introduction, around 5 seconds for each member. Introduce features of the robots, around 5 seconds for each robot. Demonstrate the games or exhibitions; the video should not be edited, once the demo started. Rolling credit and/or acknowledgement (recommended). Adults may help produce the video. If students were involved in the video production work, it should be acknowledged in the rolling credit.